Lamar Jackson won his first two NFL starts, but each of those games was played in front of a friendly crowd in Baltimore. Jackson will be tasked to win a game on the road for the first time in his young career. While the game is the same, the environment is certainly not. Jackson will have to face a hostile and vocal crowd. The home crowd advantage is significant, as home teams typically have a greater chance of winning a game than a visiting challenger. The game will prove more difficult to win if Lamar Jackson is not able to keep his composure for the Ravens. Therefore, it is of great importance that he can tune out the home crowd, and focus on driving the Ravens to victory. The Atlanta Falcons offense has disappointed in recent weeks. While the unit has struggled to score, the weapons at Matt Ryan’s disposal cannot be ignored. Julio Jones is among the best wide receivers in the NFL. He consistently puts up high numbers and creates exceptional plays. Mohammed Sanu is the best complimentary wide receiver in the NFL. His skill set would allow him to be a quality feature receiver on many teams across the league. Rookie receiver, Calvin Ridley, has impressed this year as well. Through 11 games, Ridley has caught 47 passes for 625 yards, and eight touchdowns. This offense could explode at any second. The Ravens defense which has been hot and cold throughout the season could find itself struggling to keep up with the Falcons. In order to prevent this, the Ravens secondary will need to bottle up Falcons receivers and keep the underperforming Falcons offense as underperforming. The greatest new component to the Ravens offense is without a doubt, Gus Edwards. The rookie running back took over the ground game in week 11. In Baltimore’s win against the Bengals that week, Edwards carried the football 17 times to gain 115 yards. He also scored a touchdown on the ground and the two-point conversion that followed. The performance granted Edwards another opportunity. He received his first start in week 12 against the Oakland Raiders. In the victory, Edwards again rushed for over 100 yards. He ran the ball 23 times to claim 118 yards. The Ravens offense will need Edwards to stabilize it for a third straight week. A strong run game alleviates pressure from Lamar Jackson and keeps the Falcons offense off the field. It is a win-win situation that the Ravens must take hold of. 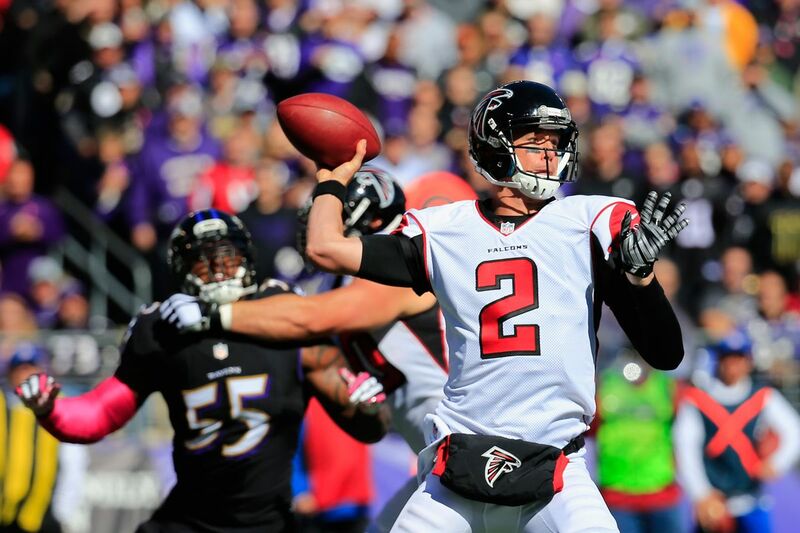 The Baltimore Ravens will barely defeat the Atlanta Falcons on Sunday. The game will come down to a final defensive stand that ensures a victory. Lamar Jackson will likely struggle in his first road start. His miscues will be made up for by the run game, which will continue to excel. Gus Edwards will again rush for over 100 yards, and Lamar Jackson will rush for 50. Jackson will throw one touchdown, but match it with two interceptions. The Ravens will also score a touchdown on the ground, and compliment the two scores with two field goals. The final score will be 20-17 in the Ravens favor.